Oware bug shelter for a group. Teach lessons, Debrief, Play music, Dine. An old favorite returns with some new improvements. Used by Utah river runners when the bugs come out. 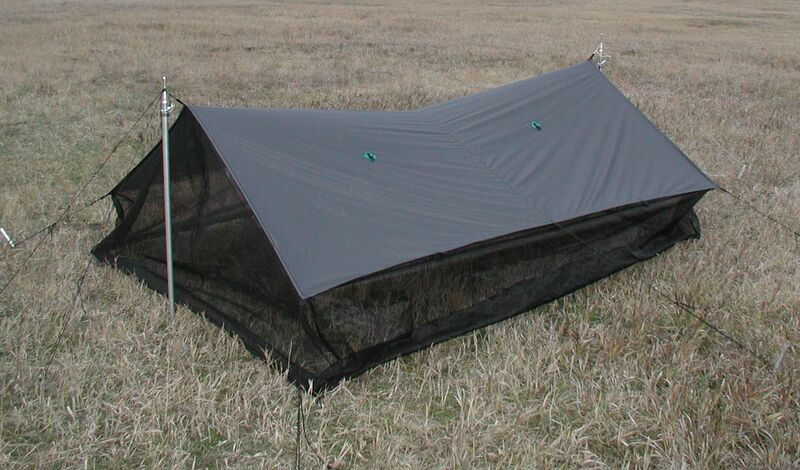 A flat tarp with noseeum netting around the edges and ends.Floorless makes it lighter and more compact. Less issues with spills while dining underneath too. No zippers to break or fill with sand or salt, just leave one corner un-pegged and lift it to enter. Two sizes available, sewn to order with several fabric choices. NetTarp5 (10×14′) and theNetTarp2 (8×10′). These now come with a cat curve cut into the hems for tighter set up and line loc3 cord tighteners on the 4 center tie outs to adjust headroom. Poles available too, but many use hiking poles, trees, or paddles for the uprights. bivysack.com or call for custom fabrics and prices.